The one thing I wanted my cousin M’sha to get me from Nepal was Jimbu (or jhiku-cha). (Update: Jimbu is now available on Amazon: Buy Jimbu Online). According to a thesis on Jimbu, it is actually two species of perennial Allium herbs (from family of onions), Allium hypsistum and Allium przewalskianum. 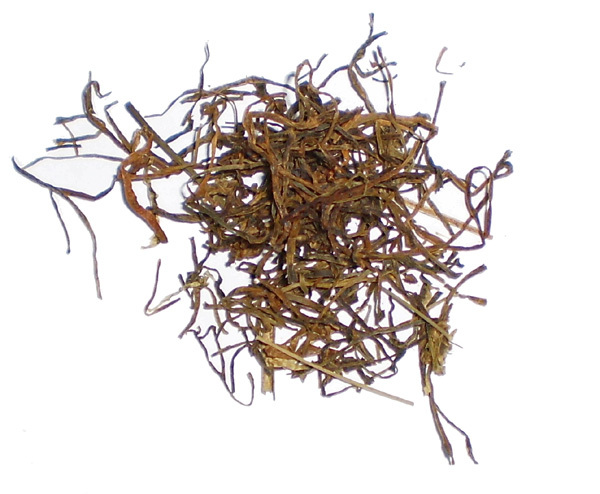 They grow in harsh dry and arid climates like that of Mustang, where the use of Jimbu as a spice may have started. The stalks of Jimbu plants are sundried and stored for use as a spice. 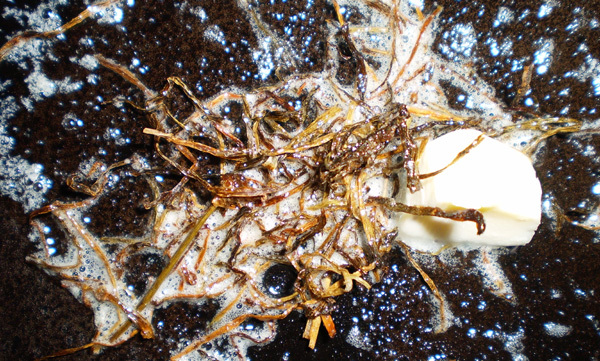 While cooking, stalks of dried Jimbu are fried in ghee, to bring out their flavors, and then added to a dish. In Mustang, it is used to spice vegetables, lentils, pickles, and even meat. 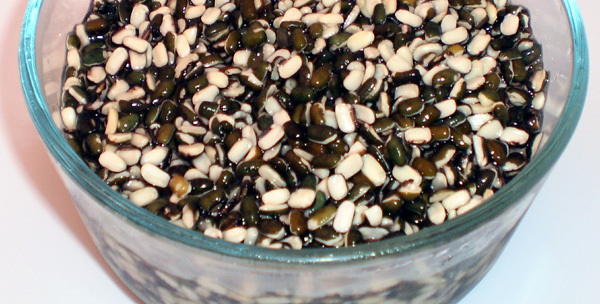 In rest of Nepal, it is commonly used to flavor a type of lentil, split urad dal. Interestingly, urad dal’s scientific name is Vigna mungo (no kidding!) and it is more commonly known as Kalo or Kali (black) dal. Like any herb of Allium species, it has perhaps high glutamate content (or glutamic acid – one of the amino acids). Glutamate is responsible for the umami or meaty flavor and also enhances flavors of other foods by stimulating certain receptors in the taste buds. When cooking urad dal, I fried a big pinch of Jimbu that my cousin M brought nearly a year ago. It was sealed in air tight zipped lock bag and seemed fine. After frying a few strands of Jimbu, it smelled of umami. I tasted few strands of fried Jimbu and it tasted similar to monosodium glutamate or MSG (yes I have tasted it!). 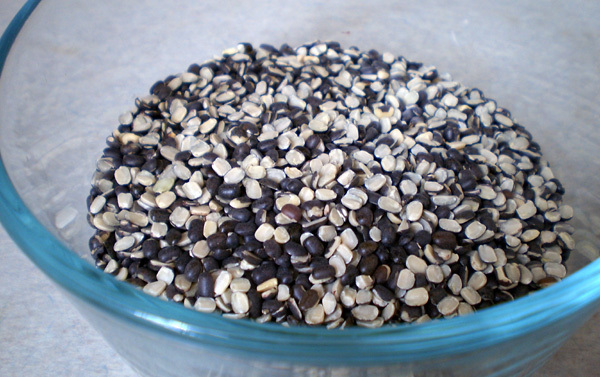 Urad dal also has a high amount of glutamate. Perhaps, it is not a coincidence that this combination of urad dal and Jimbu evolved to marry these two glutamate rich flavors giving us umami explosion in mouth, and vegans are included this time. Here is how I made my urad dal with Jimbu. Wash and soak it overnight (use drinking water). My rule is 3 (water) to 1 (urad) ratio. Cook in medium/low heat for 1-2 hour. My rule is 1 (water) to 1 (urad) ratio. When dal is cooked mash few of the beans to get a thick consistency. Fry Jimbu in ghee (or margarine for vegans). Add to urad dal. Traditionally, any fried spices or garnish (tadka) is added at the end, just before serving. However, I like adding my tadka, simmer the dal to let the flavor naturally mingle. 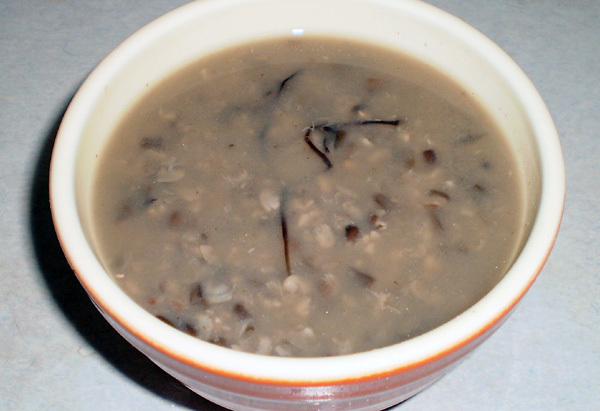 For a novice, resulting dal may look dark mushy soup. My suggestion is to reserve your judgment until you taste it. Best served with basmati rice. This looks amazing. Do you know if it’s possible to get jimbu in the States or somewhere online? I just ordered a Nepalese cookbook and will probably need it for recipes. You can find jimbu at some of the Nepali shops in Queens, NYC. One I know of is Himalayan Mini Mart in Woodside. You might also have luck in Jackson Heights if you ask around – there is a substantial Nepali population there.